Why (oh why) am I writing about Lunch 2.0 at Vidoop? A few hours before Lunch 2.0 started I ventured downtown to meet my friend at our prearranged super secret meet-up spot. Then it was time for some shopping and aimless wandering before heading over to Backspace in preparation for the big event. Then… in no time at all it seemed… we headed upstairs to the Vidoop office to attend the event known to many as Lunch 2.0… but in our house it was called… well really we called it Lunch 2.0 as well, so never mind. And then? There was some talking. Some talking that was pretty darn informative, though I had already grilled a friend the week before and forced him to explain to me exactly what it was Vidoop was all about (in case there was a test). Am I going to tell you what they said? No. Am I going to tell you who said it? NO. It was a free event. You could have gone. You chose not to. But after a mere 5 minutes of talking (with me standing in the very back on my tip toes peeking between peoples’ heads) they suddenly gave* us hardhats (some of us anyway) and told us to eat up. And he was sooooo right… except for the 62 million people that asked me for my card over the 90 minutes I was there. So mostly? It was eating, trying not to talk with my mouth full, drinking soda (not Cherry Coke) and telling people politely that I didn’t have a card but trying not to blame my husband (whose fault it clearly was) who was alternately standing across the room or snuggling up to me. And that boys and girls? Was Lunch 2.0 at Vidoop. * No one gave me a hardhat, but they said we could have them and it was totally just sitting there on the table next to where the bacon wrapped, blue cheese stuffed dates (or were they prunes) were before we devoured every last scrap. How the frak did bacon wrapped dates escape my salivating mouth at Lunch 2.0? (Yes, they were dates. I smelled them on someone’s breath.) I was lucky enough to get a spot at an actual table to eat, I got my Vidoop hard hat schwag, I made @kveton laugh and blinked dreamily at @turoczy, and yet I missed the bacon/date thingy.WTF? I thought you had my back! Please send cupcakes to make it up to me. That’s just mean. NOT all of us could just go to Lunch 2.0 and NOT all of use could have bacon dates and NOT all of us could get hardhats. And I use vidoop for Treasureliscious for crying out loud. If I whine hard enough, can I get presents? It’s my birthday and I like presents.Oh and the card? Definite keeper. 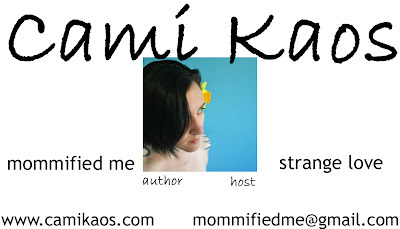 You should print some up and ignore Mr. Kaos. I still haven’t figured out the Vidoop thing, but I hope they do another bacon/hard hat event in two weeks when I’M DONE WITH SCHOOL.BTW, we have calling cards for our family and I’m working on one for BlogHer. Yours looks great; print it. Definitely dates, not prunes. I think only old people eat prunes. And I’m definitely not an old person, at least until I hit another birthday with a zero on the end. Right?Cool card. Looks like that design would work on a standard card size; have you considered doing something that would work on a moo card? why do I feel like I’ve heard this story before? oh, right. I lived it.It pleases me greatly, to see that you have stop calling Backspace, “The Backspace” although, I did notice you didn’t call Vidoop by it’s proper name. missburrows: I don’t know how to properly spell vidoopaloop.velma: Yes. Portland=Bacon talk.lisa: Next time I meet people… there WILL be cards… maybeAaron: I LOVE the moo cards. I just saw Lia’s and the only reason I haven’t printed my own cards is that I’m going ot get the moo cards instead.Stephanie: as several others have just said, check out Moo cards, Aaron linked it above. they are awesome.lilacspecs: Is it somehow my fault you don’t live here? mediachick: I blame Martin. he brought me mine and didn’t bring you one? Sad.Sybil: Yes, listen to my blog wife. She’s not stupid. Oooo…purrrdy. Both the hat and the card. Ewww. Bacon. Am I weird? If you’re going to get cards, you simply have to be one of the cool kids and go Moo. Moo.com makes fantastically cool cards from your uploaded photos and if you’re *really* cool you can point it at your Flickr photo stream … $19.95 for 100 of the coolest, most unique cards goin’. Even though they come from the UK. I am so getting me some Moo cards. And oy Kveton, what’s up with the UK?Tsk. Oh, and erm, I don’t really get what vidloopadoopdoop is. I will learn. yeah there were many words in this post that i’m convinced you made up. like ‘hardhat’. like those exist. 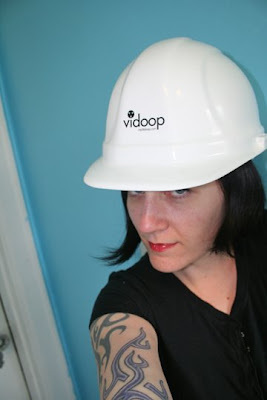 The first person to DM @Vidoop gets the last hardhat…The bacon wrapped dates were delicious, no promises but they may be back at another event coming soon.